Why should Pubs and Clubs be promoting PASS? 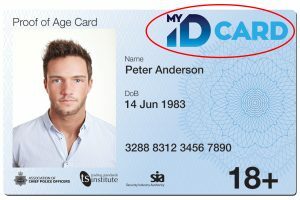 PASS Proof of age cards are a unified form of ID, the only difference in the design is the Card provider. My ID Card is registered with ID Scan and Patron Scan – Market leaders in Door Identification recognition. Peace of mind for Managers, Landlords and Tenants that we are doing everything we can to help you crack down on forgery and underage drinking. Our verification team will be on site with application forms, posters and the knowledge to take you through the whole application process. Local applicants may want to take advantage of RAPID. This service allows the applicant to visit our Basingstoke offices and have their application processed while they wait. Once successfully verified, the applicant will walk away with their new card. Come and visit us on stand 17 to find out more – we look forward to meeting you. For every My ID Card issued, the applicant receives a free 12 month membership to My ID Rewards. Here they can access fantastic savings on Shopping Cards, Hotels and Activities.